Hard work, smart planning and perseverance made 2013 a year of inspiring fair-trade activism. Vibrant grassroots activism and dogged D.C. advocacy resulted in a new level of public and congressional concern about the perils of Trans-Pacific Partnership (TPP). In November, three of every four Democrats – and a remarkable number of Republicans – publicly stated their opposition to Fast Track trade authority. The extreme procedure is seen as critical by TPP’s corporate boosters because it could railroad the TPP through Congress despite growing concerns about many aspects of the pact. 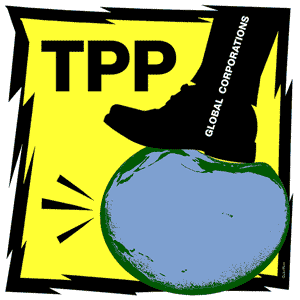 And, thanks to civil society pressure in Asia and Latin America, the other TPP country governments did not give in to all of the U.S. corporate-inspired demands for medicine monopolies, financial deregulation and expanded corporate investor tribunals in the TPP. As a result, the Obama administration failed to wrap up TPP negotiations in Singapore this month, missing yet another do-or-die, self-imposed deadline for the deal. This sets the stage for the most important U.S. political and policy fights on globalization and “trade” in decades, beginning in a few short weeks. The stakes couldn’t be higher. In the first months of 2014, Congress will decide whether it will maintain its constitutional authority over trade or succumb to White House and corporate demands to give away its power to save us from more damaging “trade” deals. Cue the rattling chains: in 2014 we must banish the ghosts of NAFTA, which haunt us still. Twenty years ago on New Years’ Day, the [ http://www.citizen.org/documents/NAFTAs-Broken-Promises.pdf ]North American Free Trade Agreement (NAFTA) went into effect. The [ http://www.citizen.org/Page.aspx?pid=758 ]World Trade Organization (WTO) opened shop a year later. Unlike past trade pacts, which dealt mainly with cutting tariffs, these agreements included investment rules that incentivized the “offshoring” of American jobs, ushering in a new era of growing U.S. trade deficits. These pacts also granted corporations new powers that raised medicine prices and limited food safety and financial regulation. Yet despite NAFTA’s devastating track record and the U.S. loss of five million manufacturing jobs since its advent, the White House has decided to double-down on a failed economic experiment. In the TPP and TAFTA, Obama has taken the NAFTA model, injected it with steroids, and invited scores more countries to sign on. Although there are powerful, deep-pocketed, international forces that will use everything at their disposal to get the trade deals passed, there is hope – and opportunity – for those of us who want to defeat them. The fiery international debates over NAFTA and WTO gave birth to a new fair trade movement in our country. The devastating outcomes triggered by the trade pacts unified ordinary Americans against them. Polls show a majority of Americans – Republicans, Democrats and independents –think these sorts of pacts are bad not only for themselves and their families but for the nation. And, the harsh lessons of NAFTA were learned worldwide. This certainly contributed to the other TPP countries’ concerns about the NAFTA-on-steroids proposals in the TPP. But we face a race against time. Will growing public opposition to the TPP in Asian and Latin American countries overcome what President Obama heartbreakingly announced this week will be his new personal effort to seal the deal in the first months of 2014? That’s where 2013’s inspiring fair trade activism comes in. To a degree not seen since the 1999 WTO protests in Seattle, the American people have awakened to the threats the TPP poses and have moved to action. New forces – from Tea Party to Internet freedom activists – have bolstered veteran fair-trade campaigners from small business, union, environmental, consumer, health, development, and faith communities. Progress has been measurable from the growing numbers taking action on the TPP to the stunning line up of congressional representatives saying no to Fast Track. Even without the sort of opposition that has grown in 2013, Democratic and GOP presidents alike have struggled to convince Congress to grant Fast Track authority. It has only been used 16 times among hundreds of trade agreements enacted since it was first hatched in 1974. And, despite efforts by GOP and Democratic presidents alike, Fast Track has only been in effect for only five years (2002-2007) of the 19 years since the passage of NAFTA and the WTO. That suggests that these agreement awakened Congress to what is really at stake with Fast Track: authorization of a dangerous form of “diplomatic legislating” – an end run around the constitutional process that infuriates conservatives and liberals alike. President George W. Bush spent two years and considerable political capital to obtain the 2002-2007 Fast Track grant, which passed a Republican-controlled House by three votes and expired in 2007. President Bill Clinton’s demands for Fast Track authority were rejected in 1998 after a two-year battle when 171 Democrats and 71 GOP voted no. Thanks to impressive fair trade activism nationwide in 2013, already a large bloc of House Democrats and Republicans have announced opposition to Fast Track. The [ https://exg5.exghost.com/owa/redir.aspx?C=W7fD1_cRekybmi1tllGG_6gKl2TO0NBIongWvzmFMrrV7AjN4JUmmr8ctQzNhCJCw4JFG–LqVA.&URL=http%3a%2f%2fdelauro.house.gov%2findex.php%3foption%3dcom_content%26view%3darticle%26id%3d1455%3adelauro-miller-lead-151-house-dems-telling-president-they-will-not-support-outdated-fast-track-for-trans-pacific-partnership%26Itemid%3d21 ]letter sent to President Obama in November by 151 Democrats declared: “Twentieth Century ‘Fast Track’ is simply not appropriate for 21st Century agreements and must be replaced.” Twenty-seven Republicans also sent letters announcing their opposition to Fast Track. Additional representatives have declared their opposition. Many GOP representatives do not want to give any new powers to President Obama. Many of the Democrats have serious problems with the TPP and demand a new mechanism for trade agreement negotiations and implementation with a greater role for Congress. The bottom line: 2014 could be Fast Track’s Waterloo. But between this prospect and reality lies a knock-down drag-out battle that will be quickly engaged with the dawn of the new year. Get ready.